The other week when I reviewed Duck Duck Goose, I said that sometimes, when a film comes along with a title as horrible as that, it’s nearly impossible to expect quality from the overall film. 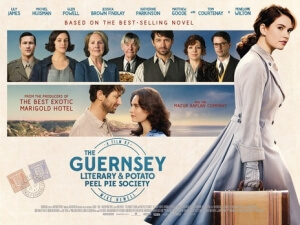 As it turns out, The Guernsey Literary and Potato Peel Pie Society – for that is indeed its name, as is the book by the late Mary Ann Shaffer that it is based on – bucks the trend somewhat, because once you overlook the wordy and rather silly name, it is actually a charming and strongly put-together historical drama that highlights an era in the Second World War that’s not explored that often, and does so with a surprising amount of grace and sensibility. Set in 1946, Juliet Ashton (Lily James) is a celebrated author for her collection of wartime essays, but is largely unhappy with her lavish London lifestyle, despite the charms of her good-natured American boyfriend Mark (Glen Powell). One day, she receives a letter from the island of Guernsey, by a man named Dawsey Adams (Michiel Huisman) who is part of a secret book club that includes himself and several of his neighbours during the Nazi occupation of the island. Intrigued by the prospect of a possible story about them, Juliet travels to Guernsey where she meets the group, but soon finds that they are hesitant to let her tell their story, especially when she asks about the group’s founder Elizabeth McKenna (Jessica Brown Findlay), who is mysteriously not around. Juliet stays on to uncover the truth about the group’s miserable time under Nazi rule, and soon finds that the place she’s been searching for to call home may be right on this island. The fact that the Nazis got as far as the Channel Islands during their march across Europe during the Second World War is one that is so rarely talked about; in fact, at the screening I was at, many people expressed how they didn’t even know that it was something that actually happened. Though technically not part of the United Kingdom, Guernsey is still a Crown dependency filled with pre-dominantly British citizens and, like Jersey and the Isle of Man, is an island that the United Kingdom takes a large amount of responsibility for; so perhaps the reason nobody really talks about the Nazi occupation of Guernsey is one of shame that Britain couldn’t do much to free its own citizens from the growing German terror. This film, however, goes out of its way to highlight the struggles and inconveniences that the Nazis placed upon this tiny community, from seizing all of its livestock and forcing farmers to grow only potatoes, to setting about strict curfews and harsh punishments for any disobedience. As a history lesson, the film works surprisingly well as it offers a glimpse into life during that brief time period, and handles the subject matter with a strong will and the dignity that it deserves, especially when focusing on the very people who lived through and survived it. While it offers an intriguing and insightful look into a particularly dark point in time, it balances things out evenly with a good and upbeat crowd-pleaser of a story with likeable characters and stunning cinematography. Director Mike Newell brings a lively tone to how characters communicate and how their individual story arcs play out, and even when the script threatens to go into standard territory, like a love triangle sub-plot which while not awful certainly doesn’t feel as naturally worked into the narrative as other things, it comes out with a winning mentality because it runs on a consistently optimistic attitude that makes even the lesser parts of this story feel compelling. The actors, too, have just about enough material to work with in order to bring these characters vividly to life; Lily James, in particular, really comes into her own here as someone who you can easily sympathise with and who has a strong-willed and passionate personality that you can rather quickly be charmed by. She is an excellent lead, and is supported by a fun ensemble cast made up of thespians like Tom Courtenay and Penelope Wilton, and equally as enjoyable character actors like Matthew Goode and Katherine Parkinson, who all get little moments to shine or in some cases, like Courtenay, remind us of just how great of an actor they really are. The marketing for this film seems to be gearing it more toward the type of audiences that went out to see both of the Best Exotic Marigold Hotel movies, least of all because some of the same producers who worked on them also worked on this one, but I would personally class the film as one that more than just geriatrics can sit down and comfortably watch. It offers an insight into a piece of history that is so rarely covered in film and television, let alone actual history books (seriously, name me one textbook you read in school that mentioned the Guernsey occupation even once), and should really be brought up a lot more when it comes to discussing Britain’s role in the Second World War, as it’s just as important to show our failings in national security rather than just focusing on our strengths. It’s an important and even provocative piece of work on that front, but luckily it also works as a sweet and hugely likeable comedy-drama that has a story and characters worth caring about, has the ability to make you laugh and cry when it’s entirely appropriate, and is handsomely made enough to make you also appreciate it on a technical level as well as an emotional one. So, let this be a lesson about never judging a book by its cover (unless it’s Duck Duck Goose): it may have a rather outlandish title, but if it’s as sweet and juicy as The Guernsey Literary and Potato Peel Pie Society is, then a silly title is worth overlooking. The Guernsey Literary and Potato Peel Pie Society is a hugely enjoyable crowdpleaser filled with fun and likeable characters, but also serves as a fascinating history lesson about a part of the Second World War that is worth looking at a lot more than it is.